It is starting to get cold in the north end of Florida, with night time temperatures dipping into the low teens, and day times only getting into the low twenties. Having moved from Northern Ontario you would think we'd find that comfortable, with some Ontario summer days having those temperatures. But alas, our bodies have acclimatized themselves to the warmer weather, and we were getting uncomfortable. So it is time to head south (actually, it's long past time to head south, but we've been busy with all the upgrades). After sitting at Sister's Creek Marina for several days, we were anxious to get out and sail down the Florida coast towards warmer weather. Sister's Creek has a fair amount of current during tide changes, but that is nothing compared to the St. Johns River's current at mid tides. Any traveling on the St. Johns must account for the tidal current. Get it wrong and you will be crawling along at only a knot or two. Get it right though, and you are flying. So after carefully studying tide charts we figured a 9:30 am departure would put us into the St. Johns shortly before the tide began reversing. We dropped lines at 9:28 and pulled off the dock. Ten minutes later we were into the St. Johns with only a slow current against us. That quickly diminished and an hour and a half later we had being swept downstream and out into the Atlantic ocean. With a light wind of 8 knots from the north, we silenced the engines and put out the beautiful multi-coloured spinnaker. It was to be a slow day, but a beautiful one. 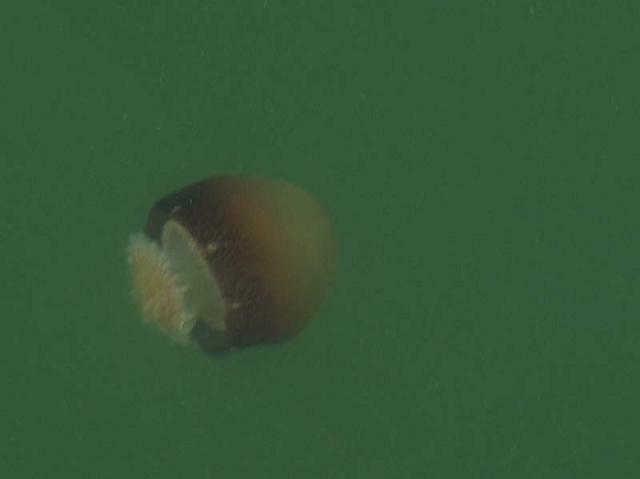 A multitude of jelly fish were in the area and we enjoyed being treated to yet another new sea creature. As always, plenty of dolphins to be seen, some coming very close to the boat. With the afternoon winds dying out we had to restart our engines as we cruised south towards St. Augustine. There are currently some very large forest fires burning in Georgia and the Carolinas, and the smoke from those fires is covering the southern states will a blanket of haze. As the sun set this haze turned a brilliant orange glow, nearly setting the sky itself on fire. Darkness descended around six o'clock and the wake of our boat through the water triggered a bioluminescent glow that left two eerie trails behind us. Overhead, the jet black sky was alive with twinkling stars. 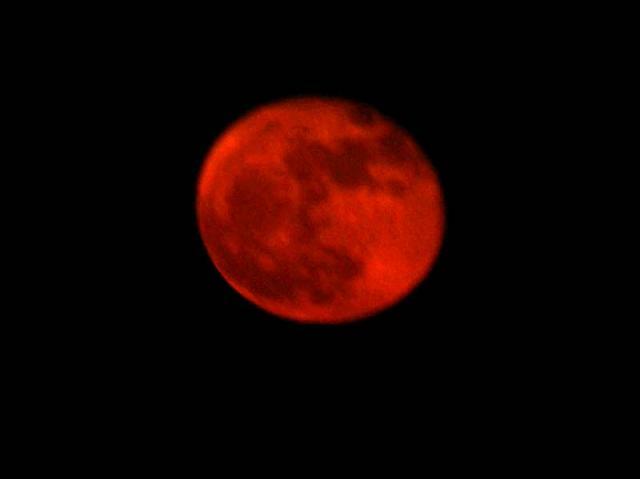 That was, until around seven o'clock, when the largest super-moon in 64 years rose blood red out of the ocean. This massive full moon set the ocean aglow in what has got to be one of the most astounding things witnessed on this amazing planet of ours. Over the next hour the moon rose higher and the colour shifted from red through orange, then yellow and finally to white, lighting up the ocean around us. Ten miles out from St. Augustine the lighthouse came into view, slowly flashing it's welcoming beacon, guiding us in. On board Sail Quest we have all the latest electronic navigation equipment, with not less than six GPS trackers, and navigation charts updated on November 17th, 2016. Along the coast now are homes with lights, but we could certainly see how a lighthouse, in days gone by before electric lights, would have been the most desired sight on the horizon. Around ten thirty, we quietly motored in to Salt Run, a large lagoon at St. Augustine. Coming in close to the beach we dropped anchor in about 2.5 meters of water. We shut down the boat, and made her fast for the night. After a quick late snack of fresh made pancakes, it was off to bed for a quiet night. Around 3:30 in the morning, I was awoken, not by the movement of the boat, but by it's lack of movement. I got up and made my way outside to confirm what I suspected, the tide had gone out and we were sitting on the sand. It was interesting to see that the lack of motion was enough to wake me from a deep sleep. I knew that 3:45 was the lowest tide so we would be back up and floating in a half hour or so. Despite being tired and relaxed, I could not fall back to sleep until shortly after 4 am when the boat was back up and gently floating again. It feels so natural to have the bed gently rocked each night that laying in a solid bed is disturbing. We spent today relaxing, and waiting for low tide. When the boat sat back down this afternoon as the tide went out, Kyle and I got into the dinghy and kayak and went around cleaning the hull below waterline. Unfortunately we were still in nearly a meter of water so we were only able to get the top 30 centimeters or so. We are going to try again tomorrow but position us closer to the beach so that we will be further out of the water. This evening after dinner we were sitting quietly when a loud "hoot" was heard. We went out side to find a huge owl sitting atop our mast. After a few minutes he flew off into the night.